Thanks for your kind words and thoughtful explanation, Bill. Don, I read and understand your sequence of events. Thanks. It sounds like it was super frustrating, to put it mildly. Also, I know, having read dozens of patents, that patents are the most obtuse and maddening things to read. And yes, the patent lawyers will make the claims as broad as the patent office will allow. So you were right to be concerned. Clearly, marketing is marketing, and love to say in-precise things like “patented marking menus”. After Autodesk acquired Alias, I talked to the manager who was interested in getting pie menus in Max. Yes, he said he that the Alias patents discouraged them from implementing pie menus but they didn’t understand the patents in any detail. Had you at the time said “as long we don’t use the overflows we are not infringing” that would have been fine. I remember at the time thinking “they never read the patent claims”. About the fact that Alias patents and marketing brochures discouraged Kinetix from implementing marking menus or pie menus, so they failed to take advantage of our unpatented publicly published research on pie and marking menus for about two decades: was that your desired outcome, or a regrettable outcome? What would you have done differently? Would you have done as Gordon suggested, and said “off the record, its ok, just don’t use the radial/linear combo” instead of “there is no marking menu patent”? 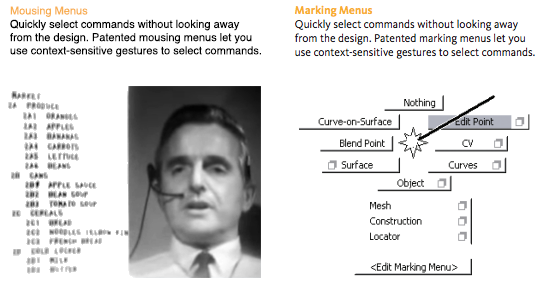 If you were in Douglass Engelbart’s place, and were granted a software patent on some obscure aspect of NLS menus, and SRI marketing spread FUD about your “mousing menu patent,” discouraging your competitor Xerox PARC from pursuing pop-up menus, would you believe that was a desirable outcome? Just how did your “marking menu patent” help increase the effectiveness of people and contribute to the progress of society?